In a ceremony in The Hague on September 26th, 2017, the World Council on City Data (WCCD) officially welcomed The Hague to the growing, global network of data-driven cities. 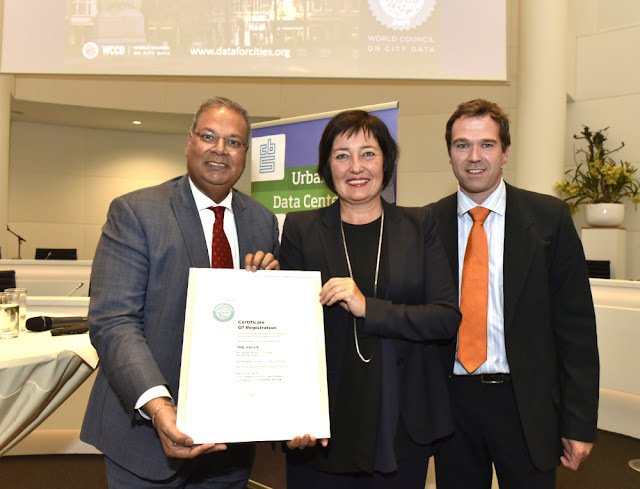 Represented by WCCD Director for Europe – Mr. Nico Tillie – the certificate was received by Vice Mayor Rabin Baldewsingh and Vice Mayor Saskia Bruines. The WCCD is the global leader in standardised city data that helps to create smart, sustainable, resilient and prosperous cities. The Hague’s membership in the WCCD gives the City the opportunity to compare best practices with other cities and actively participate in a worldwide organisation that uses standardised metrics to find innovative solutions to shared challenges. The Hague’s ISO 37120 data is now viewable on the WCCD Open City Data Portal (accessible through www.dataforcities.org) which allows for local, national and international comparisons. According to Vice Mayor Rabin Baldewsingh: “This certification is very important for us. Of course we already work with a lot of data, to improve our local policy in order to benefit our inhabitants. This is a recognition in accordance with international standards. It demonstrates that we are an innovative city, working on improvement of our service and the well-being of the city. With this certificate we have the tools to develop ourselves and work together in this with other cities, all over the world. The WCCD ISO 37120 certification comprises 100 indicators around 17 themes on city sustainability and quality of life. Cities are certified based on the recommendation of an independent third-party verifier who reviews the city data; ensuring conformity with the definition and methodologies of ISO 37120. The Hague is the sixth city to receive ISO 37120 certification in The Netherlands, joining a global network of over 50 cities worldwide.